It’s that time of year again! On June 15th, we’ll be starting our monthly Ironman lecture series for the 13th consecutive year. These lectures will be held on the first or second Wednesday (usually) of each month and will discuss in detail subjects pertaining to Ironman/Long Course triathlon training and racing. Subjects will include training volumes, equipment selection, nutrition, race day strategy, sports psychology/goal setting, and contingency planning. These lectures may be some of the most important things you can do in preparing for a successful IM or long course event. Why learn the hard way? At these lectures you can learn from others’ mistakes and share your own lessons learned with your fellow IM athletes. 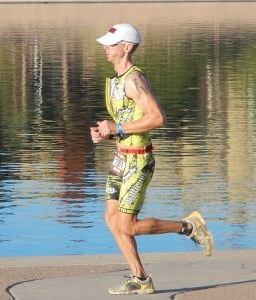 Much of the information can be applied to ½ Ironman racing as well. Everyone is welcome to attend, if you would like to bring a friend. The lectures will be held in the conference room of the Comfort Inn in Fountain Hills starting at 6:00PM and will usually be done by 7:30PM. The Comfort Inn is located at 17105 E. Shea Blvd, Fountain Hills AZ 85268. The dates of the lectures are listed below (dates and times subject to change). Hope to see you there! Lecture #1 – Training Road Map – June 15th. This entry was posted in Bike, Equipment, Ironman, Nutrition, Racing and pacing, Run, Swim, Training, Triathlete Psychology, Uncategorized on June 13, 2016 by tekgrl_admin. Like millions of moviegoers, my family and I enjoyed the mega-opening for Marvel’s Civil War this weekend. Yes, we were relaxing, but it seems, our inner coach is always on duty. Sort of like the dentist. No matter who they meet, the evaluation is happening, consciously or not. Overbite. Underbite. Man, that guy could use a new crown. . . . 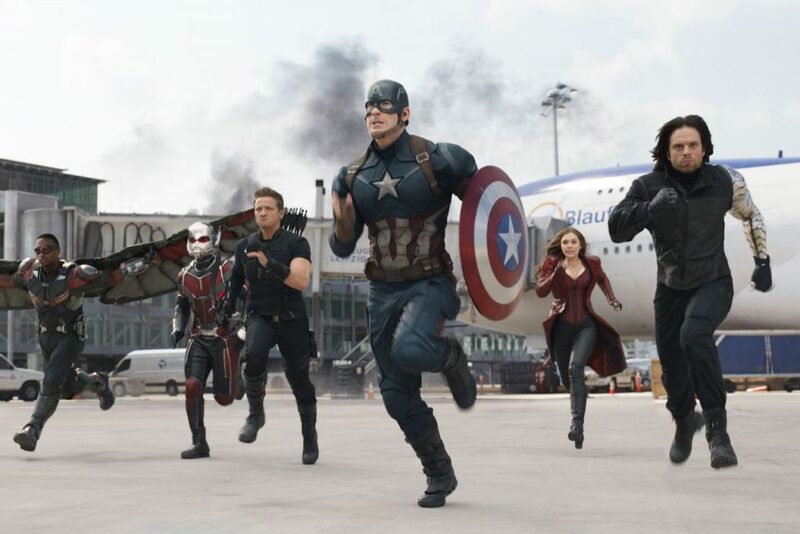 So it will come as no surprise that the analysis continued this morning when we saw the picture attached to the newspaper article that proclaimed Civil War the runaway winner at the box office over the weekend. My husband called me over. “Hey, Anne, which superhero has the best run form?” My evaluation took about half a second. “Ant-man,” I said. My husband agreed. Notice his lead foot landing right underneath his center of gravity. Great heel lift in the back. The classic S-shaped running form, or as we call it, the one-legged pirate. 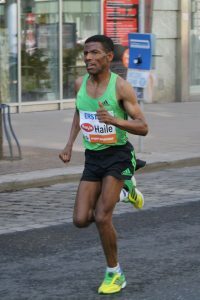 When you look at an efficient runner head on (see photo of distance running great, Haile Gebrselassie, to the left) only the upper leg—hip to knee—will be visible on one side. This means that the heel is coming up cleanly behind the runner, no wasted motion, and is setting itself up to land under the runner’s center of gravity. Maybe it’s the wings that are impacting Falcon’s run gait, but that’s quite the over-stride. And Scarlett Witch? Yep, she’s an over-strider, too. Hawkeye’s leg flares away from his body, and he’s lifting his thigh to begin the run stride. Captain America has good heel lift, however, his thigh is also lifted forward. When the thigh lift is exaggerated like this, the lower leg often follows, setting the runner up for an over-stride. Why is over-striding a big deal? Well, when your foot lands in front of you, you’re decelerating—slamming on the brakes—and it’s a horribly inefficient way to run. Ant-man definitely has it right by getting that lead foot down underneath him, nothing slowing his forward progress, just like any elite runner would do. And finally, Winter Soldier. He exhibits a side foot flare similar to Hawkeye, and he’s shrugging his shoulders, which does not result in a natural, fluid arm carriage. Granted, his left metal arm is probably unnaturally heavy, so he’s compensating, but still. So here’s to Ant-man! A superhero and a super runner! 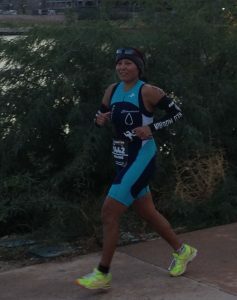 This entry was posted in Run, Uncategorized and tagged run technique, triathlon run technique on May 9, 2016 by tekgrl_admin. The math doesn’t lie. Think about your races over the last few years. In fact, go grab your logbooks or open whatever you need to find your race results. Please, go do this now. I’ll wait. . . .
Ok, now that you’re back, let’s look at your data. You will see that a small percentage of your races were clunkers. A small percentage were breakthroughs. But the vast majority were means. Admit that you’re seeing this. Internalize it. Now my question is this: Why do we view breakthrough races as the expectation, the norm, yet dismiss the clunkers as exceptions or one-offs? We all do it, right? We have that stellar race, that breakthrough performance, and yet, we expect the next one to be off the charts, too. And the one after that. And the one after that. Giant leap after giant leap. Phenomenal PR after phenomenal PR. Most of our races are mean races, or dare I say, average. Oh! That word! Average. We spit it out like cod liver oil. The average race, which I’ll heretofore refer as the mean race to protect the sensitive psyches reading this article, is a race where the athlete performs reasonably well based on the results they see in training. Reasonably well often includes measurable improvements, but unless it’s a drastic improvement, we tend to be disappointed. To be fair, we’re set up to view the mean race as a disappointment partly because we expect the rapid improvement we enjoyed early in our careers. When we first jump into the sport, every race is a breakthrough. We might have started in a relatively healthy, yet untrained state. Or perhaps we came from a single-sport specialty with little experience in the other two disciplines. With the addition of consistent training, we drop huge chunks of time race to race. But as we become more fit and we tuck more race experiences under our belts, the improvements become more and more marginal. Ouch. This is another hard word to stomach. Worse than average, even. A marginal improvement is still an improvement. You ran a 3:15 at the P. F. Chang’s Marathon last year. You ran a 3:14 this year. Outstanding. Congratulations. Based on your consistent, structured training, you enjoyed an improvement that fell right in line with where your metrics said you should have fallen. The 2:45 would be a ridiculous expectation, right? Unless you possess world class DNA, it’s not going to happen. And yet, we still expect it. In reality, a high-performing athlete who is well-trained, highly motivated and races in reasonable environmental conditions, is doing quite well to find most results falling in the mean category. The truth is, we become numb to the fact that we’re super fit. We enjoy improvements of a minute here and a minute there and we’re dejected. I mean, we could do this with our eyes closed, right? But you’re ignoring the years of training you’ve put in and how fit you actually are. It’s not until we go through a period of being untrained due to injury, or have to deal with a stress-inducing personal situation, or just get old, fat and lazy that we realize at just how high a level we were performing in these “disappointing” mean races. So going forward, how do we address the clunkers and the breakthroughs? First, let’s remind ourselves why these races happen. Clunkers are generally a result of severe environmental conditions, a lack of motivation, a poorly executed race or nutrition strategy, or some other external factor—personal stress, etc. Breakthrough races are typically a result of favorable environmental conditions, extreme motivation, and a lack of personal stress. It is important to understand that the same training routine can result in both of these races. In other words, the training did not change to produce the results, only the factors on race day did. The common reaction to a clunker is that I need to train harder or differently. The common reaction to a breakthrough race is that I should expect that performance every time. Both of these reactions are misguided. As you evaluate your races, be realistic. Some races are going to be clunkers. Some are going to be breakthroughs and most are going to be means. Your training is the same for all three. So instead of reacting to the race result and adjusting training, the successful athlete sticks with the routine and knows that the breakthrough race they so crave will eventually come, even if they are few and far between. The key is to recognize when a breakthrough race is in progress and take advantage of it and enjoy it. Having a healthy mental outlook when considering your race results will grant you the freedom to take your clunkers and breakthroughs in stride, and ultimately, allow you to more fully appreciate and enjoy your mean races. The next time someone asks how your race went, smile when you tell them that you enjoyed an average race. 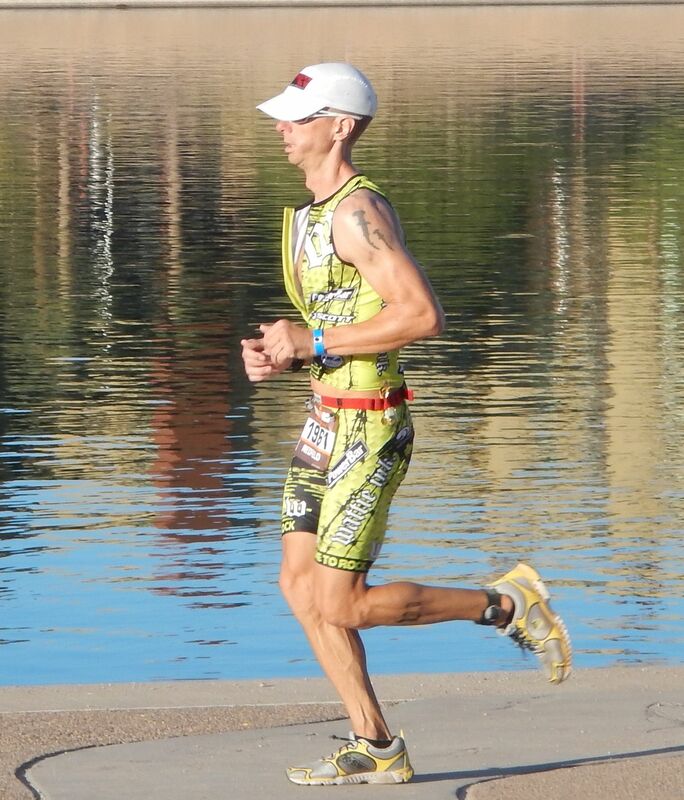 This entry was posted in Bike, Racing and pacing, Results, Run, Swim, Triathlete Psychology, Uncategorized and tagged triathlete psychology, triathlon breakthrough races, triathlon race expectations on April 9, 2014 by tekgrl_admin. It looks like the “winter” weather will be returning to Phoenix! The forecasts calls for rain on Saturday and Sunday, so we wanted to send a few notes about racing in the rain for those of you with events this weekend. First of all, rain is good. It means cool air and low core temperatures. 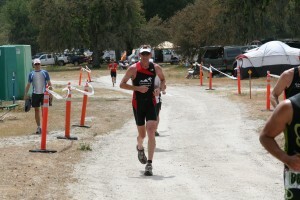 Heat is the enemy of the endurance athlete. So, embrace the rain. Recognize that it could actually improve your performance. Dress in warm clothing in the hours leading up to the race. Stay dry and warm until the last possible minute. 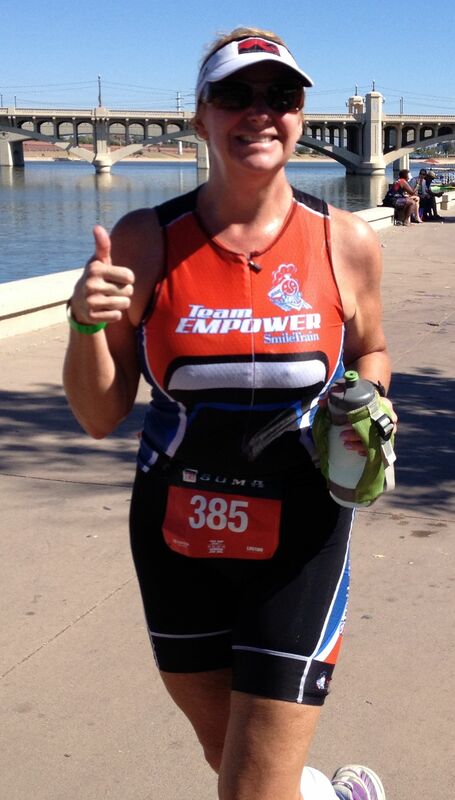 Choose race clothing that would be comfortable in weather that is 20 degrees warmer than forecasted on race day. The low this weekend is supposed to be 50 degrees, so dress as if the race was going to take place in 70-degree weather. Wear tight clothing. Tri shorts and tri tops are perfect for the rain. Baggy run shorts and t-shirts will become soaked with water and cause serious chaffing on your legs and chest. If you are really worried about being cold, then add some light gloves and a winter ski hat and maybe arm warmers. All of these items can be removed if you start to overheat during the race. Same as above for pre-race and the first run. The trick comes on the bike. Due to the cooling effect of the air on the bike, you are more prone to getting very cold when riding in 50-degree weather with rain. Tri clothing plus an undershirt (like an Under Armour synthetic t-shirt) arm warmers, maybe a vest, and light gloves will work well on a day like Sunday. Tights are usually a bit too much for the runs when it is 50 degrees. Stick to items that help keep your core warm and let the legs and feet be. Some people like to do the first run in tri clothing, t-shirt, arm warmers and gloves and then keep these on for the bike. They usually are discarded by the second run as you usually heat up pretty well as the event goes on. 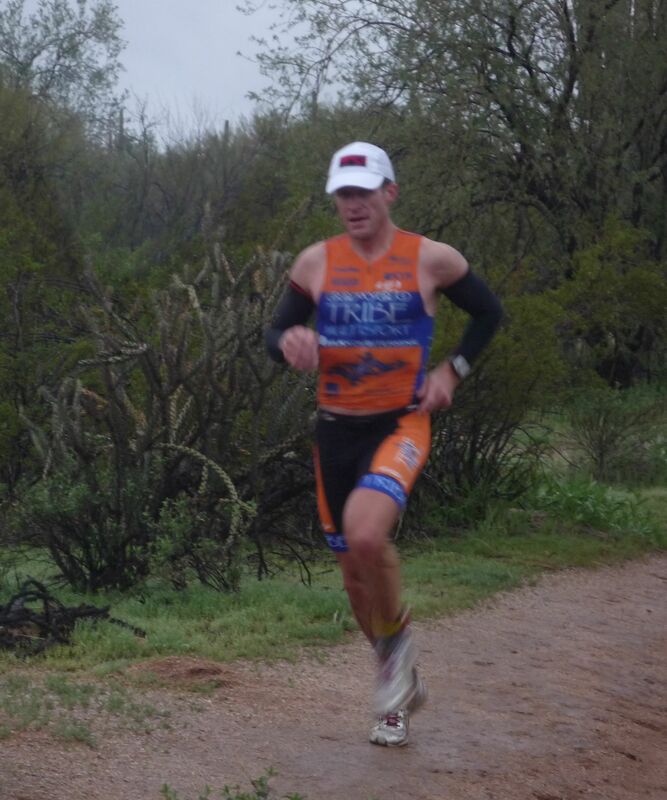 I have raced the Desert Du many times in pouring rain. The trails stay in reasonably good condition and if you add a simple layer you can be pretty comfortable even if it rains the entire day. Be sure to bring a garbage bag to place over any transition items like bike shoes or run shoes so that they do not get soaked when you are out on your first run. Keep a sense of adventure and enjoy the weather!!! This entry was posted in Equipment, Racing and pacing, Run, Uncategorized and tagged clothing, equipment, rain, running on February 27, 2014 by tekgrl_admin. Marathon Pacing: Bank energy, not time! 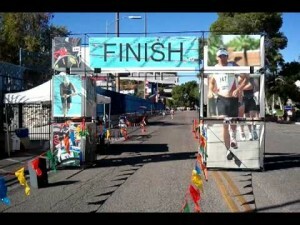 Many of you will be racing the Phoenix Half Marathon and Marathon this weekend, so here are some notes about pacing. If you read nothing else, this article can be summarized thusly: These races are about how fast you can finish, not how fast you can start! 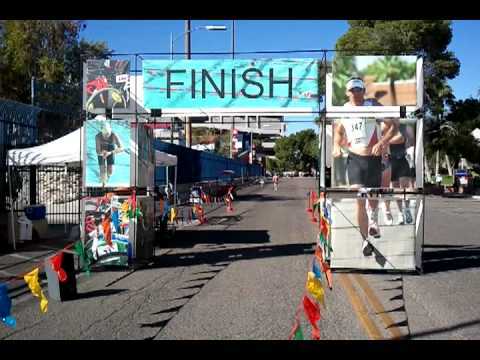 The Phoenix Half Marathon course is slightly downhill, but mostly flat, so this course should be approached just like most half marathons. Run the first two miles at level 2 heart rate*. Run at the third mile at level 3 heart rate. Time this mile. Whatever pace you hold over this third mile is the pace you should hold until mile ten. Heart rate and perceived effort will start to drift upward as the race goes on, but hold on to that pace. At mile ten, try and lift the pace to level 4-5a for the last 5K or hold what you have. You should cross the line with nothing left to give, but not fading either. Your fastest miles of the race should come in those last three miles. Eat 100-150 calories per hour (gel every 45-60 minutes), drink water as desired (17 ounces per hour on average). If you are a heavy sweater or plan on being out there for more than two hours, then take in at least 400mg of sodium per hour as well. This is a downhill course which can tempt people into running too fast in those early miles. The name of the game on a downhill course is to bank energy not time. Run the first 13 miles at level 2 pace as though you were on flat terrain. Notice, the intensity is written as level 2 pace – not heart rate. Your heart rate may only reach mid to high level 1 when running downhill. Do not force your heart rate up into level 2 and run 30 seconds per mile faster. If you do this, you will over-stride on the downhill and, very casually put, beat your quads up. This will lead to muscular fatigue by miles 15-18. So, keep things ridiculously easy on the downhill and get ready to run well over the last 13 miles of the course. At mile 13, try and hold a solid level 2 to low level 3 heart rate. You can start to work a little bit once you are past half way. Your goal is to get to mile 20-22 feeling strong. At mile 20 (aggressive) or mile 22 (conservative), start your finishing kick. Over these last miles you may push yourself to level 3 and up. Again, some of your fastest miles of the race should occur in this last section. The key to the entire race is to save your legs and your energy on the downhill section. Many people will try and run faster on the downhill in order to get ahead of the goal pace and will have their legs shut down in the last 10K from muscular fatigue. Eat 100-150 calories per hour (gel every 45-60 min), drink water as desired (17 ounces per hour on average), take in at least 400mg of sodium per hour. This entry was posted in Racing and pacing, Run, Uncategorized and tagged marathon nutrition, marathon pacing, run pacing on February 26, 2014 by tekgrl_admin. 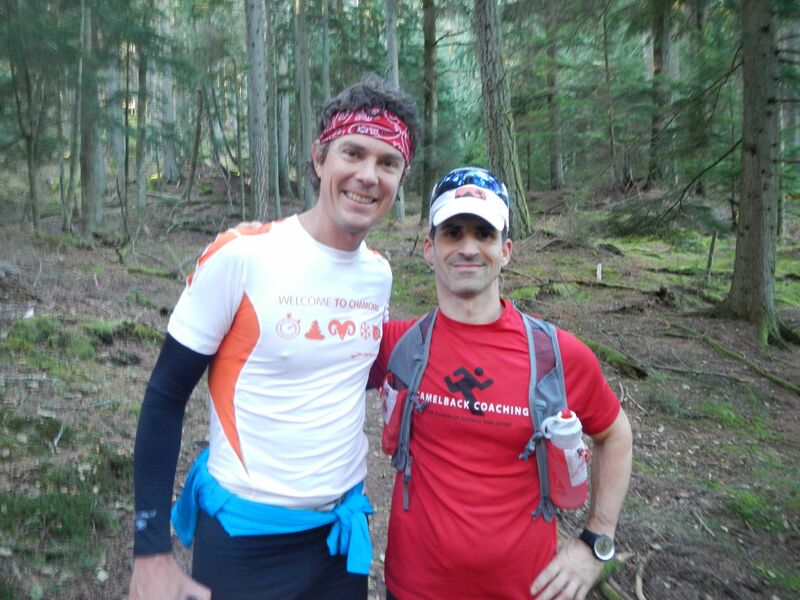 Todd Silva had the opportunity to run with Scott Jurek, the ultra-marathoning legend, who won the Western States 100 seven years in a row–just one example of almost too many ultra-running credits to list. Todd lives in Orcas, WA and runs with the Orcas Island Running Club. This entry was posted in Run, Training, Uncategorized on December 2, 2013 by tekgrl_admin. Most people understand the role a heart rate monitor plays in long course racing. It helps us maintain a steady pace and can let us know when we’re in need of nutrition. But many people think the heart rate monitor has no role in short course racing such as sprint and Olympic distance races. In a sprint, you just go all out, right? But what if your perception of “going all out” doesn’t actually match with the effort you are capable of giving? You just can’t sugarcoat a threshold effort. It hurts. A lot. And many athletes aren’t willing to stay there, let alone go there in the first place. But if you really want to race at threshold, a heart rate monitor can ensure you’re actually getting there. For example, a sprint distance race is generally raced at or near lactate threshold, especially on the run. If a person perceives they are working at threshold on the run, and they know their lactate threshold occurs at 165 bpm, but they see 155 bpm on their monitor, they now know they still have 10 beats to give. This little piece of information might help them dig just that little bit deeper to finish a 5K as best they can. The heart rate monitor can also provide useful data for post-race analysis. We often hear people say, “I didn’t do so well on the run,” or “I felt great on the bike. I don’t think I biked too hard.” But without real data, it’s impossible to know how well a person executed their race. If that same runner who has a threshold heart rate of 165 bpm analyzes their data after a race and notes an average heart rate in the mid 160’s, they can feel confident they gave their best effort on the day. If they see an average heart rate in the mid 150’s, they would know that perhaps what they perceived as “going all out,” wasn’t necessarily the case, or perhaps their run was affected by biking too hard. “I had a great bike, but I don’t know what happened on the run.” If only we coaches had a for dollar every time we have heard this. I had a great bike, but . . . What does that really mean? Often, it means the athlete has “overbiked.” If this athlete has had a less-than-stellar run and has worn a heart rate monitor, they can use heart rate data from the bike leg to determine if they spent too much energy on the bike course. For example, if a person has a lactate threshold heart rate of 165 bpm on the bike and cycles in an Olympic distance race—which is raced at slightly below threshold—and after the event, notes their average heart rate was above 165 bpm, and that the bike leg included several spikes into the 170’s, it’s safe to say they “overbiked” the course and didn’t leave enough for the run. In summary, the heart rate monitor serves two valuable purposes in short course races. It gives us a piece of information during the race to ensure we are working as hard as we can, and it provides valuable data after the race to confirm how well or poorly we executed our race strategy. This entry was posted in Bike, Equipment, Racing and pacing, Run, Uncategorized on May 18, 2013 by tekgrl_admin. 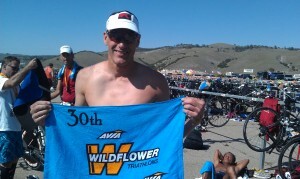 Wildflower—a world renowned triathlon classic. Here are some points on logistics and race strategy for the long course event that you might find useful. One of the things that makes the Wildflower experience unique is the camping. Yep, you and eight thousand of your closest triathlon friends pitch tents or park RV’s for a weekend of camping. Be sure to bring warm clothes for the evening as it can easily drop to forty degrees overnight. Bring food and plan to purchase it prior to your arrival. There is a general store located at the race site, but most campers stock up prior. Paso Robles, a town forty-five minutes from the race site, is a popular spot for last-minute purchases. Bring water, although there is usually running water near the camps. Porta johns are numerous and are serviced regularly. Each camping area will usually have a BBQ pit and/or fire ring. Ear plugs are nice to have if you are a light sleeper as many athletes will still be arriving at the camp ground late into Friday night. Registration opens at 12 noon. This is the best expo in the sport. Take a look around and enjoy! Again, be sure to bring warm clothing for the evenings and morning of the race. Winter hats, gloves, down jackets are not out of place here. The expo area/transition area is about 1.5 miles from the camp (overflow camping, that is). Shuttles will be available, but most people just ride their bikes down to transition—down because it is all downhill to the lake. Keep this in mind because if you’ve ridden your bike down, after the race, you’ll have to haul your stuff up!. A nice backpack or transition bag is essential to carry all of your gear down to the race start in the morning. When you arrive at the transition area race morning, plan on having a bit of a wait for your start. Depending on your wave, it could be an hour or more. Expect 20+ waves at this race. 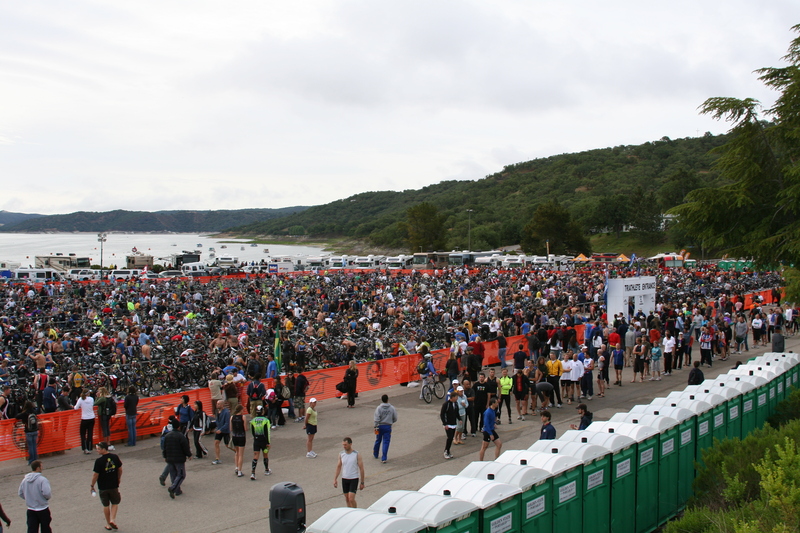 Set up your transition area, take care of the porta john business, and then hang out and watch the early waves head out. The swim in Lake San Antonio is one of the nicer parts of the course. Expect cool water in the 60s. The course does not head into a rising sun, so sighting is pretty straightforward. Try and swim at a steady level 2-3 pace. 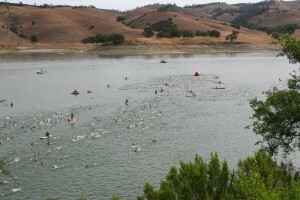 The effort should feel less urgent than an Olympic distance race. Nice and steady—it’s a long day. Once out of the swim, complete your transition. The first mile or so of the bike is along the lake on a rough road. If you plan on doing a flying mount and putting your shoes on underway, try and complete it sooner rather than later as the road gets rougher the further you get from transition. After about the first 1-2 miles, you turn right and head up the first climb of the day. This is called Beach Hill and is very tough. Having just exited the swim, your legs might not be quite ready for a climb yet. As soon as you hit the hill, shift into your easiest gear. A 12-27 cassette is recommend in the back and a 52/39 in the front. Also, if you have a choice of wheels, pick the lightest pair you have. Shift straight to the 27 for this climb and try and maintain your rpms as well as you can. If your rpm starts to decay below about 60, then get out of the saddle and use your body weight to get over the steepest part of the hill. This climb will feel tough, but tell yourself that it is one of the hardest climbs of the day. It gets easier from here. After cresting Beach Hill, you’ll experience about 10 miles of big rolling hills. You will hit 35+mph on the downhills, which helps you to carry some momentum into the uphills. Try not to overwork this section. Your effort for the first 15 miles should be mostly level 2. 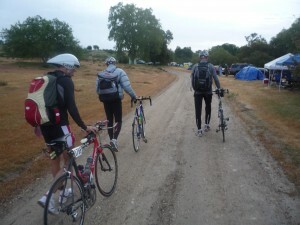 You should feel like you are out on a normal long training ride. Do not ride the first 15 miles at level 3 or harder or you will fade dramatically on Nasty Grade and the last 10 miles of the ride. At about the 15-mile point, the course flattens considerably and becomes flat to gently rolling. If there is no wind, then this is a fast part of the course. You can now build your effort to a steady level 2-3. You should feel like you are at tempo pace or just below tempo. At mile 38 or so, you will cross a metal bridge. Many people consider this the beginning of Nasty Grade and the return to the hills. The road does not really start climbing after the bridge, but it will definitely feel like you are on a false flat. About a mile or two past the bridge, the climb starts in earnest. Soon, you will find yourself in your easiest gear again. Find a steady rhythm—something you can sustain for the next 15-20 minutes. The hill gets steeper the longer you are on it. About halfway up, you will see an aid station. If you have some fluid left in your current bottle, you might want to avoid grabbing another one here as the extra 500 grams is just dead weight for you to carry onto the steepest part of the climb. 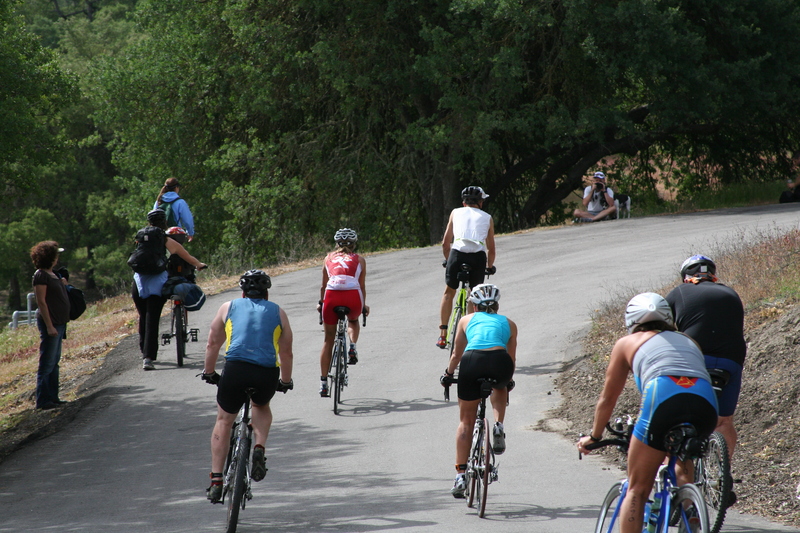 At the top of the climb, you will see many fans and what appears to be the top of the hill—do not be fooled! You will turn right at this point and continue to climb for another 5 minutes. Be mentally prepared for this and it will make that last bit of the climb easier to deal with. 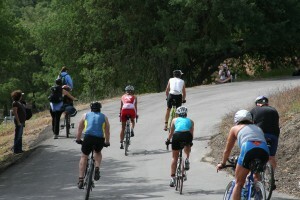 Once at the real top of the climb, you will encounter the biggest descent of the day. The road curves to the right and drops steeply before curving back to the left. It is not uncommon to hit 50mph on this descent. Use your head and only go as fast as you are comfortable. Sit upright for more aerodynamic braking and use your brakes, as necessary, to feel safe. Once off of the descent, you will be about 9 miles from the transition area. Believe it or not, this is the toughest part of the course. You have made it over the most challenging climbs and are about 46 miles into the ride. It is easy to check out mentally at this point. However, these last 9 miles are over big, rolling hills back to the park. With accumulated fatigue and the rising temperatures, these last 9 miles are hard. Be prepared for them and keep telling yourself that the race is not over after Nasty Grade. The last mile of the ride is all downhill back to the lake and the transition area. If you paced the first 15 miles well and used your easiest gears on the climbs, then you should be ready to head out to the half marathon run in good shape. 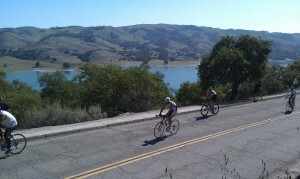 The run course starts with a 2- to 3-mile section along the lake on the same bumpy road that you rode to start the bike. There are short, steep hills along the way. Shorten your stride and keep your cadence high on these rollers. You may even consider walking the steepest pitches in order to save some energy for later in the run. Aim at running a level 1-2 or 2-3 pace depending on how you are feeling. After about 3 miles, you arrive on the trails. For the next 7 miles you will be running on fire roads and trails. It is beautiful, but it can get hot. Be sure to stay wet by dousing yourself as much as possible at aid stations. Between miles 4 and 5, you will find the steepest climb or series of climbs on the run. The trail turns steeply up for about a mile. Many people choose to power walk this section. More power to you if you can run it! The top of the steepest pitch has typically been the location of the infamous “naked aid station.” The organizers have tried to stamp that out, but don’t be surprised to find naked co-eds handing you a drink! Once at the top of the hill you run steeply down for about 400 yards before the trail flattens in a meadow. You will soon pass the mile 6 aid station and head into the camp grounds. At about mile 6.5, you run right through the campgrounds where 8,000 fellow triathletes and their friends/family have been camping. This is as close to the Tour de France as many of us will get. The crowds line the road and cheer like crazy. It is an absolute rush. Be sure to control your energy as it is easy to find yourself running at level 4 before you realize it. 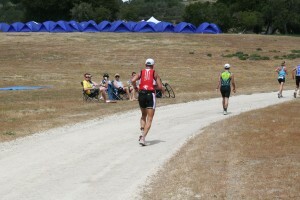 At mile 8 you leave the campground and your energy leaves too! Be prepared for this. Once you leave the campground, stay focused and make mile 10 your next goal. 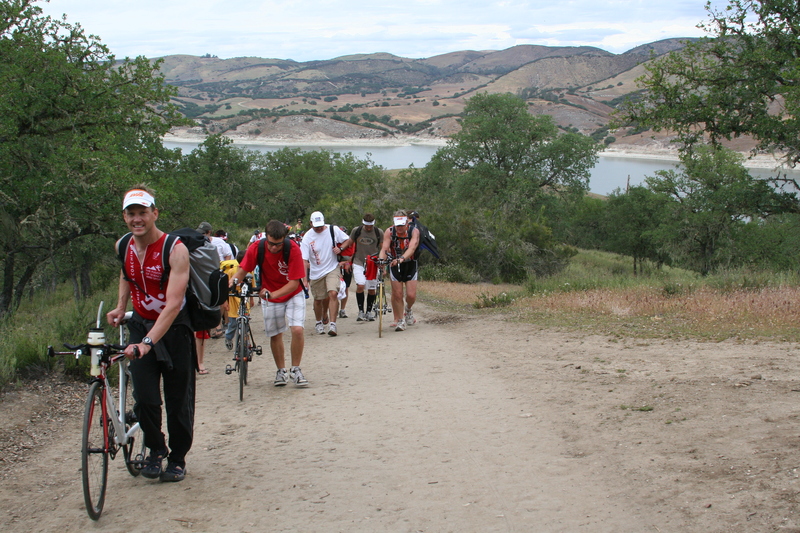 At mile 9, you leave the trail and get back on the road and climb a short hill. You run down this hill for 1 mile—which is nice—until you realize that you have to run back up this hill. Mile 10 comes at the turnaround at the bottom of the hill. If you are doing well, you should try and run up the hill steadily. If you are struggling, then consider walking for 1 minute and running for 2 minutes to get up the hill. From the top of the hill, you have about 2 miles to go! After cresting the last hill of the day, you run downhill for a mile. Stay under control and keep your cadence high. This can be a painful run as your quads are about done. At the bottom of the hill, you will hear the announcers’ voices and the music. You have 400 yards to the line – kick it in and finish with a smile! Take your time to fully recover in the post-race area and let your body cool. Once you feel ready, you can tackle the last leg of the race—the hike back to the campground. It is a 1.5 mile hike on steep trails to get back (if going to overflow camping). This is where your backpack really comes in handy. Once back at the campground, kick back and enjoy having finished one of the greatest long course events in the world! As for any long course race bike leg, aim at drinking 20oz of fluid per hour, eating 100-300 calories per hour, and ingesting at least 400mg of sodium per hour. Once on the run, drink a mouthful of fluid at each aid station, eat a gel every 45-60 min and be sure to get at least 400mg of sodium down. Products on the course normally include Gatorade Endurance Formula and Power bars and gels. 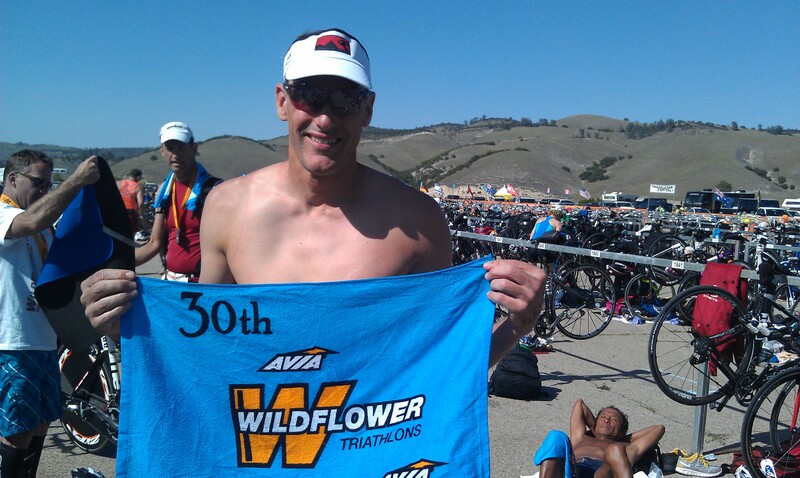 This entry was posted in Bike, Equipment, Nutrition, Racing and pacing, Run, Swim, Uncategorized on April 25, 2013 by tekgrl_admin. In June, we will start our monthly Ironman lecture series for the ninth consecutive year. These lectures will be held on the first Monday (usually) of each month and will discuss in detail subjects pertaining to Ironman training and racing. Subjects will include training volumes, equipment selection, nutrition, race day strategy, sports psychology and goal setting, and contingency planning. These lectures may be some of the most important things you can do in preparing for a successful IM or long course event. Why learn the hard way? At these lectures, you can learn from others’ mistakes and share your own lessons learned with your fellow IM athletes. 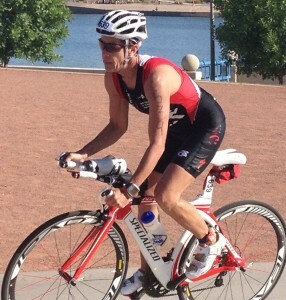 The lecture series is free to all Camelback Coaching athletes whether you are racing an IM or not. 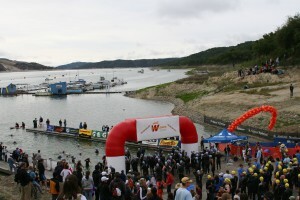 Much of the information can be applied to ½ Ironman racing as well. Others may attend at a cost of $10 per lecture. The meetings will be held in the Camelback Coaching office starting at 6:00PM and will usually be done by 8:00PM. We will provide food and drinks. The dates of the lectures are listed below (dates and times subject to change). We will send reminder e-mails prior to each one. If you cannot attend please be sure to let us know and we’ll send you the power point presentation. This entry was posted in Bike, Equipment, Ironman, Nutrition, Racing and pacing, Run, Swim, Training, Uncategorized on April 9, 2013 by tekgrl_admin.